Long loved by parents for their durability, educational purposes and the LEGO company’s social and environmental responsibility, LEGO bricks have become a standard construction toy in almost every household. 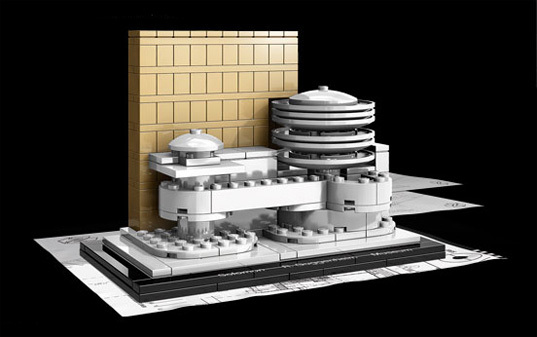 And with the addition of the Solomon R. Guggenheim Museum, Frank Lloyd Wright´s Fallingwater getaway, the Empire State building, Sears Tower and Seattle Space Needle — all part of LEGO’s Architecture Landmark series designed by Adam Reed Tucker — LEGO kits have been propelled into the realm of collectible toys. Reasonably priced (the Landmark Series is $19.99, while the Architect Series will set you back $39.99 for the Guggenheim and a hundred bucks for Fallingwater), you won’t find any of the standard primary color blocks in these sets. 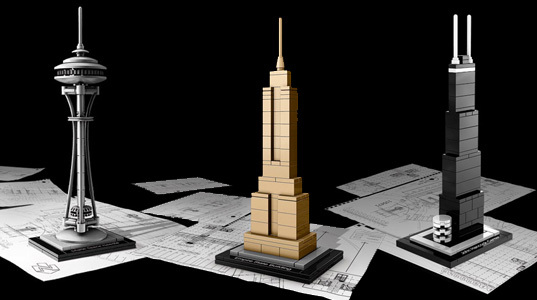 Custom shapes (to mirror Gunite) and rare hues (the Empire State Building is rendered in gold bricks) ensures that the miniature masterpieces will just as likely end up being showcased on the living room coffee table as being tucked away in the toy bin. Bring the magic home. All sets are available at the online LEGO shop. The problem with Legos though is that they're not very eco-friendly. It's one of the worst things we own - just mounds and mounds of plastic. I've been looking for a greener alternative for years but no luck. However, Cedar is obsessed with them and since there's no eco-alternative and because he's good about most green stuff, he gets them. He has and likes sustainable wooden blocks too, but they're not the same. I just wish Lego was more eco-friendly. You can use old blocks to make stuff sure (planters, furniture, etc. ), but few people do and they actually make some bricks with recycled plastic (but very few), which kind of begs the question if you CAN use recycled plastic, why not do it across the board. Long loved by parents for their durability, educational purposes and the LEGO company�s social and environmental responsibility, LEGO bricks have become a standard construction toy in almost every household. And with the addition of the Solomon R. Guggenheim Museum, Frank Lloyd Wright�s Fallingwater getaway, the Empire State building, Sears Tower and Seattle Space Needle -- all part of LEGO�s Architecture Landmark series designed by Adam Reed Tucker -- LEGO kits have been propelled into the realm of collectible toys.